Yet Another Commission* is done! 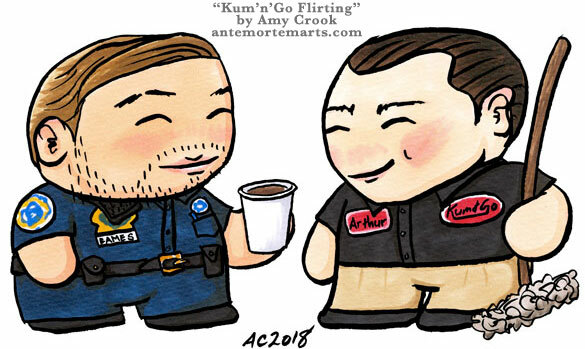 This is Eames as an EMT and Arthur as a night-shift worker at the actual real convenience store chain Kum & Go. They’re flirting over a cup of coffee, with some cute blushes and happy faces, because it doesn’t matter what universe they’re in, they’re adorable together. *Getting closer to the end of the list! Another of my fellow fangirls wanted some extra special chibis for our Slack emoji, and so we have some ridiculousness. 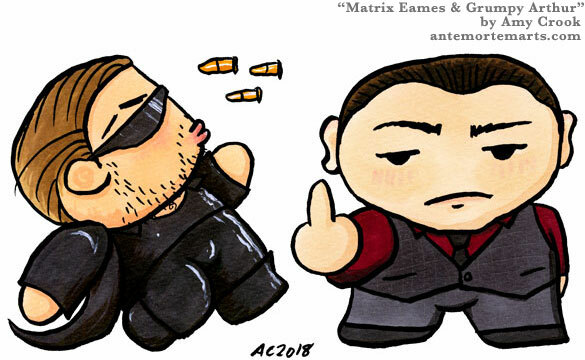 Matrix Eames was especially fun to do with his wobbly bullets and super shiny outfit, and then grumpy Arthur brings both attitude and fashion sense to the table. The commissioner was delighted, the Slack group was delighted, so really only Arthur is put out by any of it. More commissions! More Inception! More chibis! This wonderful person was happy to be led to my list of needed emojis for our Slack, and we chose the chinhands and spit take as ones for her commission. 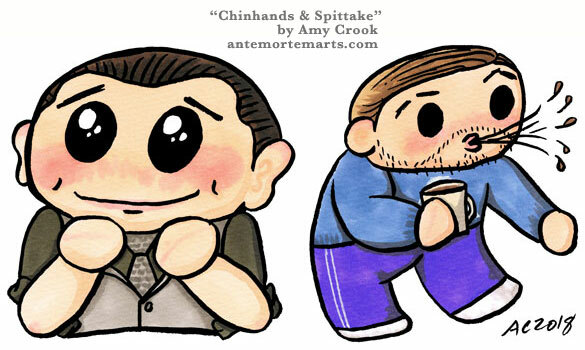 Especially of note are Eames’ purple trackies, and Arthur’s beautiful blush. Want a commission of your own? Email me and I’ll get you in the queue! 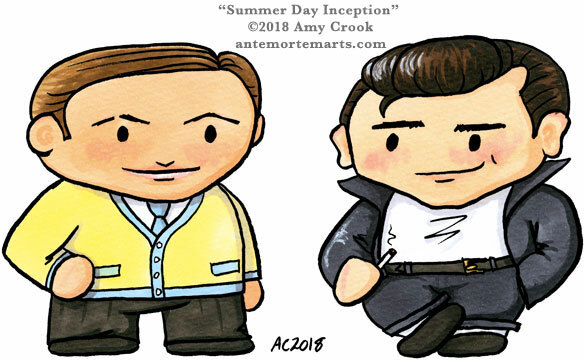 And so we continue the “you had to be there” week of FANbruary with this Inception/Grease mashup. Eames cleans up nicely for the Sandra Dee role, while Arthur greases down just as excellently. Look at the shine on that hair! There is an explanation for this art, but it’s long and strange and really all you need to know is that it’s a commission for the writer of the single most-commented fic on a certain archive. It’s also another entry for FANbruary, which is a lovely celebration of fandom. 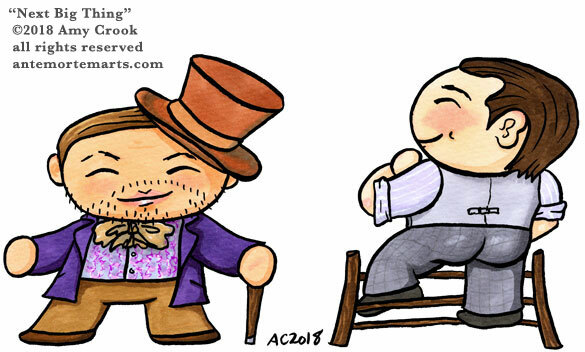 Is this where I just admit I have sold a LOT of these chibi commissions lately? But they’re just so fun, I have no regrets. These are for Halloween, of course! 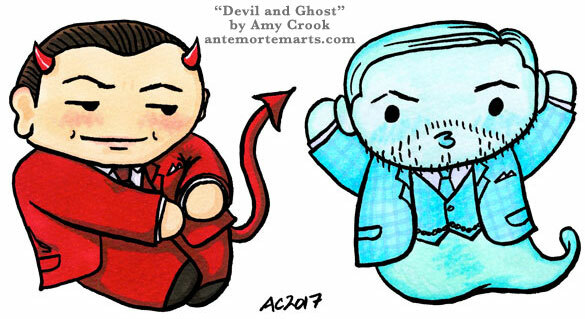 Arthur and Eames from Inception coming back again as the Devil and a ghost. Arthur is smarming it up in his red velvet suit, straightening his cuffs as he leans nonchalantly in wait. Eames is looking extra spiffy floating along in his vintage windowpane check. 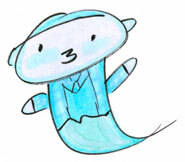 And of course on the right I have the little sketch ghost I drew just to test Eames’ colors before the real thing. Boo! These are drawn as close to a square aspect ratio as possible, so that they work as emoji on Slack. Their adorable 2-head-high chibi style conveys a lot of personality in a tiny space. For this second set, my patron wanted an artist Eames since we have so many writing/working emoji (and we have a LOT). Neither of us could resist the idea of Arthur in the “draw me like one of your French girls” meme pose, so that became the model. No logic explains why I drew them backwards on the page, though, sigh. Whatever it is you need to be encouraged to do, Arthur’s telling you to go for it.